I'm just trying to get an idea of what would be a good versatile lighting equipment to invest in. For remote shoots, interviews, outdoor concerts, sporting events, indoor studio and other type of shoots. I figure it's practical and affordable if I look into used or possibly slightly older models. So I'm wondering if something like this kit would be idea, or if people have other suggestions. I've been in this business almost 20 years now. I moved over to 5600k lighting about 3 years ago and have never been happier. Low heat, no cool down, not blowing breakers, not lugging 12GA extension cords, don't have to gel to match windows, can use windows/skylights/etc as additional fixtures (instead of the old "close the drapes" mentality). Personally, I find myself in a lot more situations with streaming 5600k light that I'm trying to match than 3200k light I'm trying to match. If I were in your shoes (with nothing), looking to build a kit, I might look for a couple of 1000 LED fixtures, and a couple of small peppers for that hard back-light look. Scan local craigslist/backpage for local lighting deals. eBay... too sketchy. Les thanks for the link, I'll check it out. Yes Lowel is a name that pops everywhere I see on such shoots which led me to investigate further. You bring a good point on the tungsten, I'll have to ask around to see what others done to fight it. Another colleague pointed out to check if the lightbulb for the older unit is hard to obtain, which I'm having a little trouble discerning if non brand names are just as good as the name brand. Mike thanks for the feedback, though I'll admit I've had some trouble with craig's list for the reasons you pointed out of ebay, so I've at least use it as research purposes, unless I know the buyer is on the level, but one things for sure I've have very positive dealings with the dvinfo.net members. It's where I picked up a 2nd hand camera here. I recently identified an investor to help defray some of the cost for a lighting kit, so now my options are better. 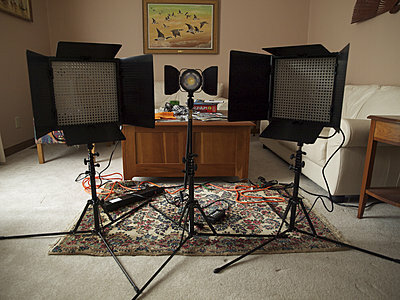 :) I figured the Lowel's the best bang for the buck, but to be practical, was looking at a versatile light kit. (Specifically to handle studio shoot, documentary shoot, remote outdoor shoot, and even still shoot). I know I can always mix and match, but I just want to keep it simple before I start thinking about expanding on it. But thought I ask everyone to get some options. For its price that's not a bad kit, but understand that for what you want to do, to do it really well, you're going to need bigger/better/MORE lights to get a really solid professional look. There's no "one size fits all" kit, and I love lowel lights to death but in my experience they really shine as extra lights, in a kind of "I need a light over here but none of my regular lights will do the job or are worth the money... let's pull out the lowels!" They're great for backlight, they're great for getting minimum exposure levels up, they're great for adding some light to that hallway over there or to shove under the bar to highlight all those nifty liquor bottles. So I tend to think of them as more add-ons than the core of a kit. Still, like I said for the price that's a good place to start if you just want to get some light on your subjects and add a bit of flair, you're going to be a bit limited in controlling the light though. That kit is fine. Personally, I think the money would go further on ebay with used Lowel stuff but.... in the future, you can add a speed ring and softbox on that Tota. Alex and Les, thanks again for your feedback. Out of curiosity, what light equipment do you use for shoots in general? And have you or thought of upgrading/investing lighting equipment of your own. Lowel makes what I call "entry-level pro" gear. Lightweight, tough, simple. 90% of my shoots are indoor, location interviews, and here's where "hot lights" really shine. (ha) You can soften a hard light, but never "harden" a soft one, so they can be pretty versatile, throwing light a long way. Skin tones render especially well with tungsten/quartz sources. I've amassed a collection of Lowel gear, one Rifa66 ($250 used w/o a screen) and two Omnis w/ barn doors and gel holders (for $100). I also have a "Lowel-like" 250w hairlight/kicker from Britek (I wouldn't buy one again). A few dimmers, a mix of light stands and c-stands, flags and scrims takes care of almost all of my lighting, and I can light tight, two-person interviews with this setup. I don't have much use for the Totas for what I shoot, since they just throw light all over the place, but would be good for bringing up ambient in a large space. Or sitting inside a softbox with a "speed ring" (an oxymoron term). But once you use a Rifa, you won't go back to any other kind of softbox, since they open and close like an umbrella (and almost that fast). To use a kit like this, you have to control the extraneous light on location, and have access to at least two discrete circuits of 120v power. And they do make some heat. Every system will have its pros, cons, and tradeoffs. And certain lights will excel at certain things and be a poor choice for others. If I had a studio, I'd invest in the big flo cool banks and just a few hot lights for hair & kickers. But I've lugged my gear around to a hundred locations every few years, and lightweight, rugged, "entro-level pro" gear gets the job done for me. ...Out of curiosity, what light equipment do you use for shoots in general? And have you or thought of upgrading/investing lighting equipment of your own. I've added Rifa and Totas softboxes. In my studio, I use Kleigl Fresnels and Altman micro pars. But as noted in the above article, there's more to a kit than just it's fixtures. Les & Brian thanks so much for your insights of how you went about starting out with your lighting purchase. I think I've got a good idea what I'm going to do, but then again don't be surprise if I may have follow up questions everyone.